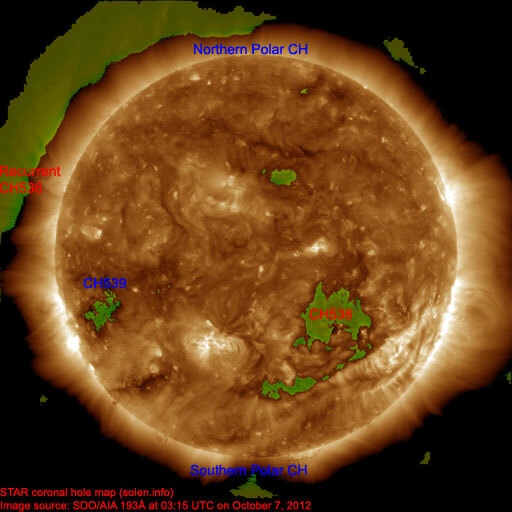 Last major update issued on October 8, 2012 at 04:20 UTC. 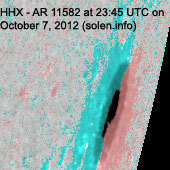 Minor update posted at 04:40 UTC. 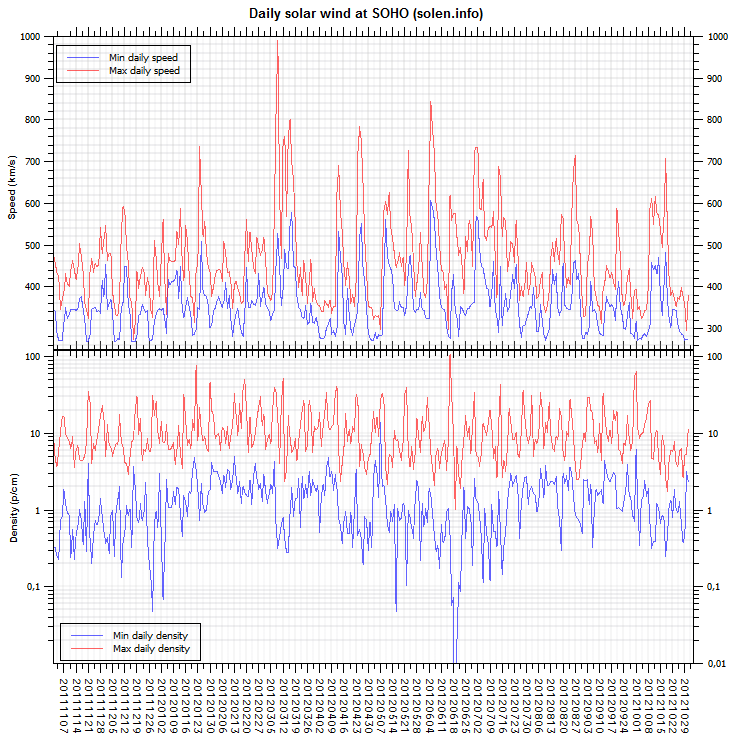 The geomagnetic field was quiet to unsettled on October 7. 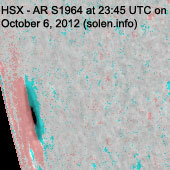 Solar wind speed at SOHO ranged between 282 and 345 km/s. 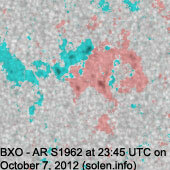 Solar flux measured at 20h UTC on 2.8 GHz was 98.1 (decreasing 13.2 over the last solar rotation). 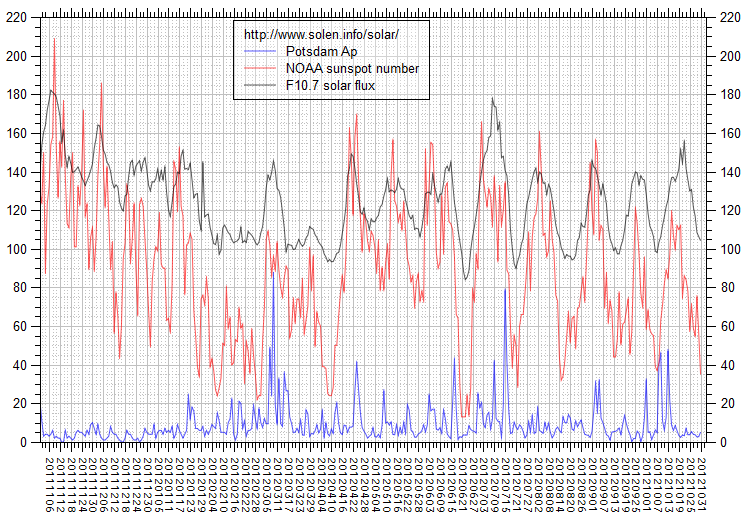 The Potsdam WDC planetary A index was 6 (STAR Ap - based on the mean of three hour interval ap indices: 6.3). 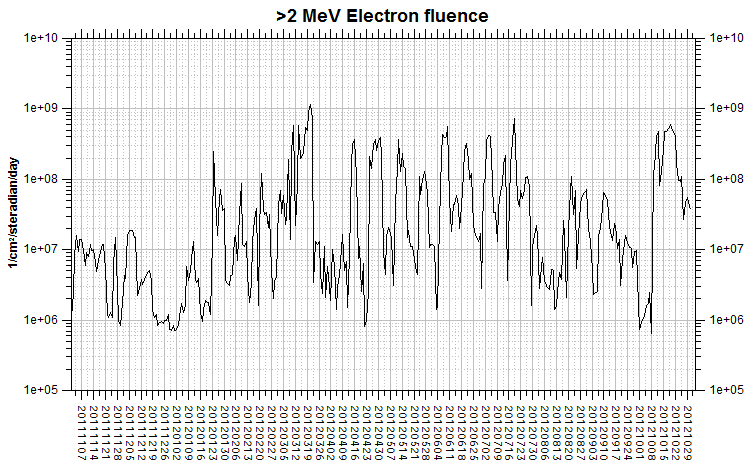 Three hour interval K indices: 12121123 (planetary), 02122212 (Boulder). 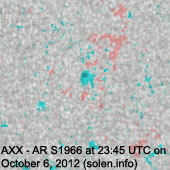 Region 11582 [S12W77] was quiet and stable. 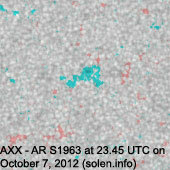 Region 11585 [S19W01] was quiet and developed slightly. 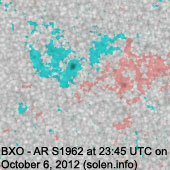 New region 11586 [S12E66] rotated into view on October 6 and was numbered by SWPC the next day. S1962 [N08W29] developed slowly and quietly. 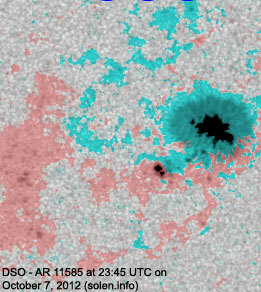 S1963 [S08W11] reemerged with a tiny spot. 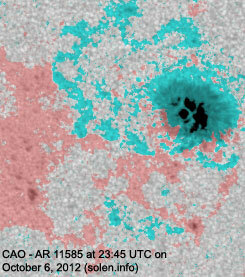 An interesting region about a day behind the northeast limb was the source of the day's only C flare, a C1.2 event at 20:46 UTC. 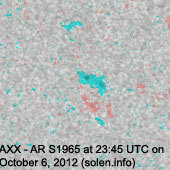 This region may be capable of producing M class flares. 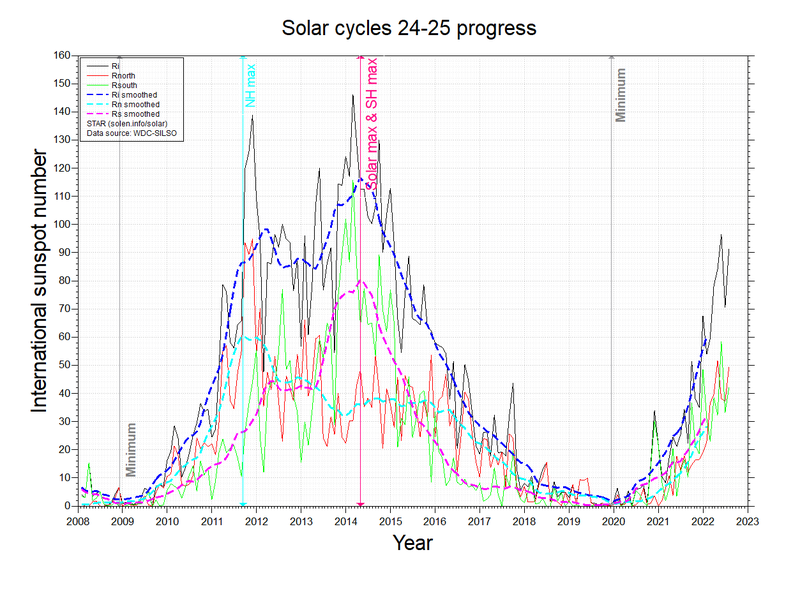 Minor update added at 04:40 UTC: A moderate solar wind shock was observed at ACE at about 04:30 UTC. The Bz component of the interplanetary magnetic field immediately swung moderately to strongly southwards. 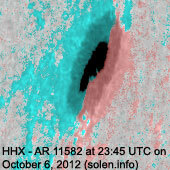 This is the arrival of the CME observed on October 5. Active to major storm conditions are likely for the remainder of the day. 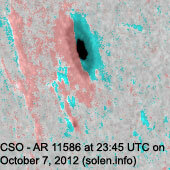 October 6-7: No obviously Earth directed CMEs were observed in LASCO and STEREO imagery. 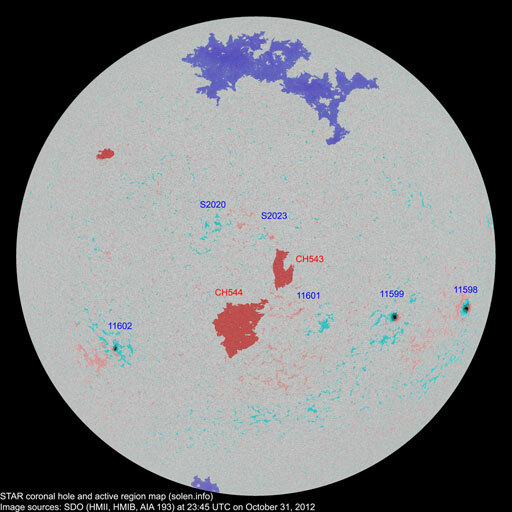 The geomagnetic field is expected to be quiet to active on October 8-9 due to a high speed stream from CH538 and effects from the October 5 CME. 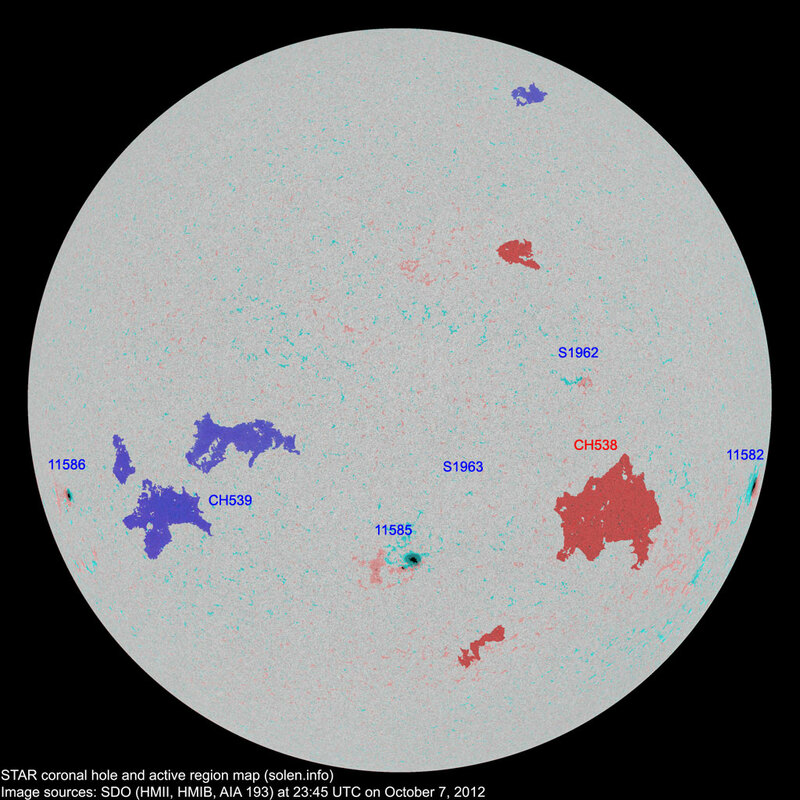 Quiet to unsettled is likely on October 10-11.